Pokémon Go has taken the world by storm and as such everybody is either playing it or writing about it on social media. Whether you love it or hate it or don’t even understand it you’ve probably spoken about it. Everyone is talking about it online at least and I for one am loving it. 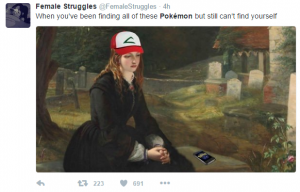 To be honest, I’ve never even played Pokémon Go and frankly I can’t really see what all the fuss is about but the social media posts that have come out of it have me laughing and cackling away like a crazy old loon on the daily. Maybe Jesus’ brand team need to create an app so he’d become more popular with the younger generation. At least this tweet received a lot of buzz. They get it hard. My weekend was spent at the dog park, with my actual, live dog. There were an unusually large number of people around without dogs. They were running around, at first I thought wow, good on you! Then I realised they were playing Pokémon Go. So I laughed and then thought, good on you! More power to you I say. Or less as the case may be, if you have no time to do anything else. Is this why so many less people are watching the Olympics these days? Maybe all the workers working on the Olympic Village had to catch ‘em all! It’s an addiction for some. If you manage to break the addiction I think one of your Twitter followers might give you a chip. And yes, if you hire a driver to drive you around to catch Pokémon, you have a serious problem. Get help. And then there are people who almost get it. At least they’re trying right? Who hasn’t watched a movie or picked up a new book based on the hype it’s gotten to see what all the fuss is about for themselves? I know I have. Not completely life evolving for everyone though unfortunately. Whether you’re a big fan of the life-changing, fitness-driving app that is Pokémon Go, whether you’re an adult or a child, you’ve probably somehow been caught up in all the hype whether through the game itself or within your social feed from players you know or you’ve just been enjoying the incoming Facebook posts and tweets from around the world. If you’re a bit of a curmudgeon about it, look for the silver lining and see the funny side. At least more people are getting exercise and the kids are actually getting outside now.